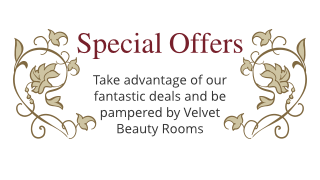 Welcome to Velvet Beauty Rooms Online! Velvet Beauty Rooms is a new beauty salon. Our facilites include three luxury relaxing treatment rooms, a spray tanning room and separate manicure area. We offer a wide range of fantastic beauty treatments including facials, waxing, manicure, pedicure, body and massage treatments which can be tailored to suit your individual needs. All products used in our salon have been carefully selected and we use respected and trusted brands such as Dermalogica, OPI, Lash Perfect, Harley and ARK. We also have a range of retail products for your home use. Our friendly and knowledgeable qualified therapists will make every effort to ensure that your visit to our salon will be pleasant and enjoyable.